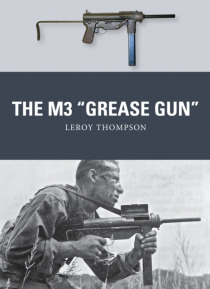 Influenced by the German MP 40 and the British Sten, the .45-caliber M3 Grease Gun served as the primary US submachine gun for almost a half-century. Designed to replace the expensive Thompson SMG, the M3 was issued to airborne troops and others during World War II thanks to its compact design with sliding wire stock. An improved variant, the M3A1, was favored by armored crews right up to the be… ginning of the 1990s, seeing service in 1991's Operation Desert Storm. In Korea and Vietnam, reconnaissance troops and special-operations forces were at times armed with the M3A1 also available in a suppressed version and it was the first SMG issued to the US counterterrorist unit Delta Force. Featuring full-color artwork, first-hand accounts, and archive and close-up photographs, this is the engaging story of the M3 submachine gun.